Someone Bought This: How could the XFL have failed? Find out in this book! - WrestleCrap - The Very Worst of Pro Wrestling! Someone Bought This: How could the XFL have failed? Find out in this book! 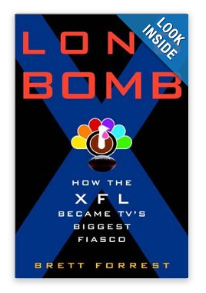 We’ve covered the WWE’s failed football league the XFL in an induction before here on WrestleCrap, but this book “Long Bomb” explains just how Vince McMahon came up with the idea, what went so very, very wrong with the league, and why it only lasted one season. It’s out of print, but used and new copies are readily available on Amazon Marketplace. 25 Responses to "Someone Bought This: How could the XFL have failed? Find out in this book!" I still have a XFL ball, and a Las Vegas Outlaws cap. I always liked that LV logo. Maybe one day WWE will release a “The Rise and Fall of the XFL” DVD set. Okay, fine, just a “The Fall of the XFL” DVD set. Hey, if the WWE Network ever gets off the ground, maybe Vince can have NFL films produce the documentary. On another note, as a proud Canadian and ardent CFL fan/supporter, it’s interesting to note that Vince McMahon wanted to purchase the CFL and use it to compete with the NFL. When that didn’t work out, hello XFL. I’m sure they could get it only a single DVD, unless they were going to include every game as an extra. I’m still proud that I taped the only XFL Championship Game and put it on DVD. And remember it’s not about the money but $1,000,000 goes to the winning team (whenever Jesse said something wasn’t about the money I laughed so hard) and that came out to roughly $11.24 per team member. Tommy Maddux rules!!!!!!!!!!!!!!!!!!!! I have it sitting on my bookshelf right now. 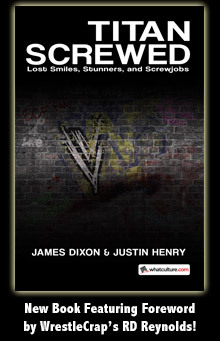 It’s going for as low as 3.07 on Amazon, a must read for any wrestling or football fan. Sounds like an interesting read. Ive always wondered what the sentence “This idea sucked from the beginning.” would look like in book form. When do they get a 30 for 30? What was that mediocre Arnold movie that featured the XFL in a brief cameo? “The Sixth Day.” It’s also the reason as to why he appeared on Smackdown around the time the movie came out. He was presented with a WWE title belt and he knocked out Triple H.
Arnold knocks out Triple H, and appears in stuff like Hercules In New York. How can you not love the guy? That cover really should be the Gooker as the NBC Peacock. What episode of the Simpsons is that screen grab from? Off the top of my head I don’t know. Sorry! It ‘s from “the old man and the key”, season 13. A good Grandpa Simpson episode. As for the league, who could forget the ‘X’ standing for nothing (it was supposed to be the Xtreme Football League, but there was already another league being formed that year with the same name. Derp! ), and the race for the ball to determine 1st possession. Classic stuff! 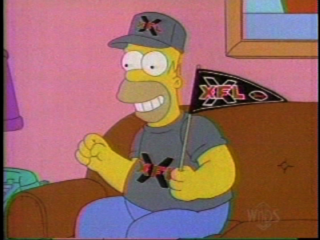 I actually liked the concept of the XFL. Hey, at least when Arnold ko’ed Trips and Tyson ko’ed HBK, given their reps as toug bad asses, we could buy it and accept it. Which is more than I can say with regards to Money Mayweather ko’ing Big Show. That was pure, unadulterated Wrestlecrap!! Speaking of XTREME! garbage that failed, when are you guys going to induct Women’s Extreme Wrestling? If only the XFL champions were given the Steve Lombardi Trophy. Also for essential viewing/hearing is Opie & Anthonys accounts of working in the XFL.